You should free space on your hard drive to keep your PC running well. You need to free space on your hard drive more often with Vista than with earlier versions of Windows. 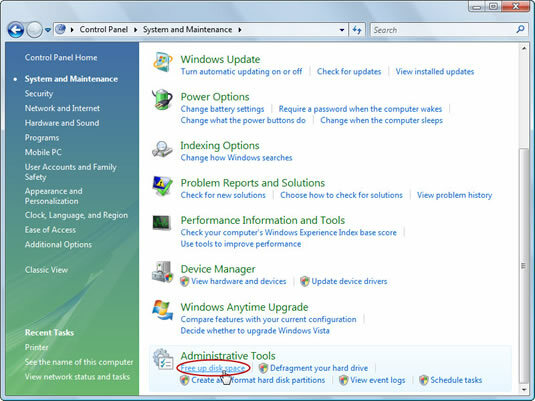 1Click the Start button and choose the Control Panel’s System and Maintenance category. Then choose Free Up Disk Space from the Administrative Tools section. 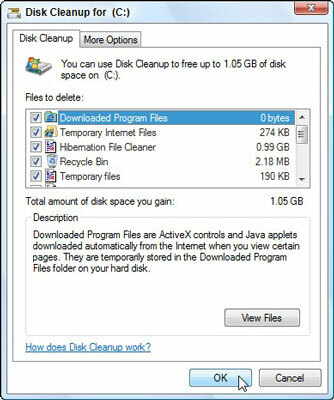 Vista asks whether it should clean your files, or every user’s files. 2Choose Files from All Users on This Computer. 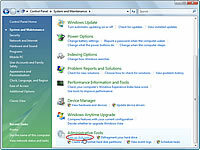 This step empties the Recycle Bin and cleans up trash from every user account on your PC. If your PC asks you which drive you want to clean, choose the first one listed, the C: drive, and click OK.
3Select all the items and then click OK.
Vista presents the Disk Cleanup window. Select all the check boxes and then click OK. As you select a check box, the Description section explains what’s being deleted. 4Click Delete Files when Windows Vista asks whether you’re sure. Windows Vista then proceeds to empty your Recycle Bin, destroy leftovers from old Web sites, and remove other hard drive clutter.